Miami-Dade Police Department detectives found plastic bins clearly marked "BIOHAZARD" and medical backboards among stolen items during a raid as part of an investigation into stolen plastics. The bins and backboards are supposed to be closely tracked but how they ended up among the stolen items is being investigated. 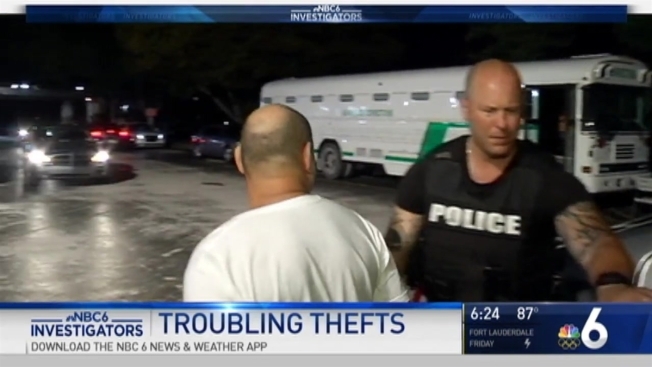 In March, NBC 6 Investigators were there when 20 people were arrested and accused of stealing plastic crates and other items from retails stores. The arrests came after an investigation by Miami-Dade Economic Crime detectives. The 20 are accused of stealing $1.5 million worth of plastic crates from local retail stores. Police say the plastics were ground up into bits to be sold. During the raid, NBC 6 photojournalist Adam Rice captured images of the plastic medical bins and backboards. The bins are used at hospitals to store medical waste. The backboards are used to transport injured and sick people. Because these items could hold biohazardous waste, health officials expressed concerns about who is handling them. "Only authorized people, only people with training should be handling this type of waste," said Dr. Samir Elmir, the Division Director for the Environmental Health and Engineering unit of the Florida Department of Health in Miami Dade County. He said people handling the items could be exposed to infection. So, NBC 6 Investigators wanted to find out how these items ended up with stolen plastics. The Florida Department of Health in Miami Dade County attempted to determine how the medical items ended up at the warehouse, but was unsuccessful. The bins that were found are typically used at area hospitals. The backboards are shared among six fire departments including Miami Beach Fire, Hialeah Fire Rescue, Coral Gables, Key Biscayne, Miami-Dade Fire Rescue and the City of Miami. One of the backboards found at the raided warehouse appeared to belong to the City of Miami Beach. However, records from Miami-Dade Fire Rescue show that the backboards went into general circulation to be shared by all six departments in 2012. Now all backboards used by the six departments are labeled with a multi-agency logo. That logo was not visible in the stack of backboards found at the warehouse. Late Wednesday, the Miami-Dade Fire Department said the private company that has a contract to sterilize and distribute the backboards sold old backboards. They now believe those backboards are the ones found at the warehouse. "We take the security of our equipment – backboards very seriously,” said EMS Chief Officer for Miami-Dade Fire Rescue Rowan Taylor. "They are purchased to be used by the residents of this county." Stericycle, a waste-management company in Doral, has a $56,000 yearly contract with Miami Dade County to sterilize and re-distribute used backboards and miscellaneous medical equipment to be shared among the six fire departments, according to Miami Dade County records. The contract states Stericycle is "responsible for collecting multi-governmental agency orange blackboards," among other medical equipment from Miami Dade and Broward County hospitals. Stericycle did not respond to our questions late Wednesday about if the backboards had been legally sold. In a previous email asking for response about the plastic items found, Jennifer Koeing, Vice-President of Corporate Communications for Stericycle, wrote "We appreciate that you have contacted Stericycle about this issue. However, we are not open to an interview or commenting as it is our policy not to publicly discuss services provided to our customers." "The safety of our patients is our top priority, as we follow strict guidelines to ensure we provide top quality services to our residents and visitors. We can positively assure our residents that none of the backboards in question in this investigation ever belonged to MDFR."